We are well and truly in the middle of Autumn and this year I have fully embraced the season. I have bought my Winter Coat, got the seasonal candles at the ready and I am enjoying wearing all my warm and cosy clothes on really cold days. AUTUMN LEAVES// When the leaves begin to fall I think that streets look so pretty. On the street where I live there are a couple of big trees and from the end of August the leaves start to turn colours. I love all the colours in Autumn; especially the colours of the leaves: reds, oranges and dark yellows. 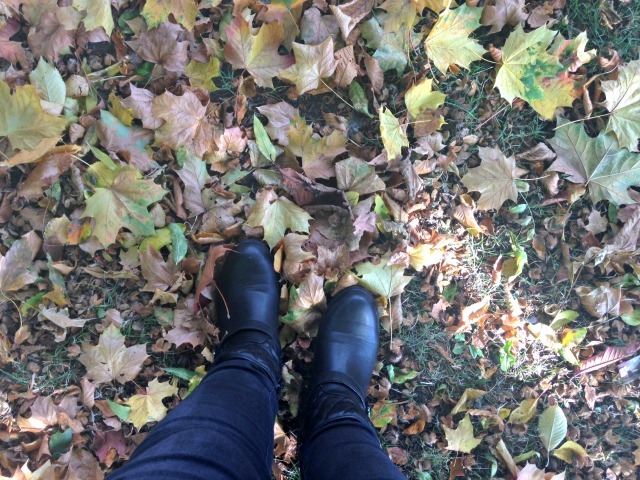 Also who doesn't love feeling like a 5 year old walking through the leaves and jumping on big piles just to hear the crunching sound coming from your feet! SCARFS AND BOOTS// Because I live in the UK I find I can get away with wearing scarfs all year round. In summer I wear thinner ones that are brightly coloured - but they still add a bit of warmth for when it's cooler. However in Autumn I get to bring out my big knitted and tartan scarfs. As my wardrobe is fairly plain I like patterned or colourful scarfs which is also a really good way of making your staple wardrobe look autumnal. From around October I literally live in Boots (the shoes, not the shop. Although I wouldn't mind living in the beauty ales on Boots!) . I have a brown pair and two black pairs that will see me through nicely this year! COMFY CLOTHES AND BLANKETS// Finally, in Autumn I become obsessed with blankets and comfy clothes. Literally as soon as I get home from school the uniform comes off and the comfy clothes go on. By comfy clothes I mean cosy leggings, big knit jumpers or if I'm feeling particularity cold the Christmas pyjama bottoms come on. Also on an evening there is nothing better than snuggling up in front of the TV with the fire on and all wrapped up in a warm blanket. What are your Autumn loves? Anything knit. Big chunky sweaters, cable hats, mittens, etc.